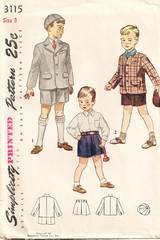 Vintage Simplicity sewing pattern 3115. Box jacket has flap-trimmed pockets and one welt-finished breast pocket. Front button closing; long sleeves. Notched collar or cardigan style. Short trousers have pockets in side seams. Belt carriers at waistline. Large or small fly opening. Lined cap, cut in eight sections, is peaked in front and has covered button on top. Boys' Size 3; Chest 22; Waist 20.5.